Working in partnership is a reality for many Ontario non-profit groups and organizations. Your organization may have few human or financial resources, be spread throughout the province or represent diverse communities. Working in partnership can enhance your ability to implement complex strategies to achieve community change. The health of our communities requires more than any one group can provide. By connecting health practitioners, local programs and service providers, and community members, we can combine experience and best practice across disciplines to achieve far more together than would be possible on our own. In essence, community partnerships help to improve health and equity for all. However, partners can have different objectives, activities, resources and expectations about working in partnership. Dynamic and effective partnerships require time, attention and learning new ways of working together. Dynamic and effective community partnerships practice these six activities3, each partnership in its own unique way. Whether you are forming a new partnership or maintaining an existing one, these activities are equally relevant. 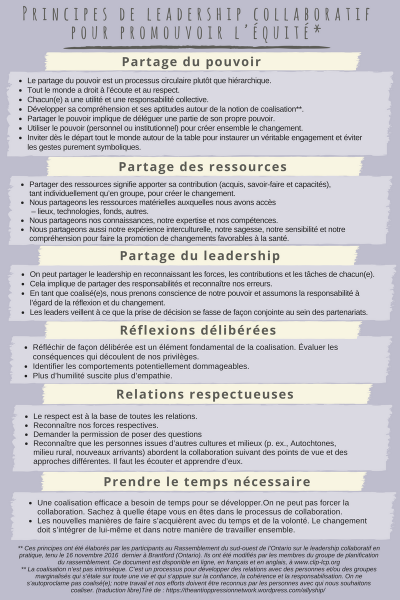 Adapted into English from Outil 8: Matrice d’analyse des ressources mises en jeu dans le partenariat. Repères et Outils pour des Partenariats Équitables et Solidaires, Cercle de Coopération des ONG de développement. Février 2013. This document is a Word file, to make electronic use easy. Working with community partners often allows us to accomplish more than we could working on our own. This resource provides a brief overview and selection of resources, websites and other materials to 'get you started’ in developing partnerships. Gillian Kranias responds to partnership challenges experienced by team members of a public health unit in Ontario. Provides an overview of some of the many approaches to evaluating the functioning of partnerships and the work they do as well as some principles that should guide decision-making early on in the process. Connecting the Dots: A Handbook for Chronic Disease Prevention through Community Engagement. The toolbook offers a concise overview of the essential elements that make for effective partnering. It contains seven tools to develop, sustain and assess inter-sectoral partnerships. This easy-to-use guide includes helpful strategies, flowcharts and tips for working with other agencies to build and maintain partnerships, along with partnership development tools. This resource is designed to help organizations develop a clearer understanding of the range of purposes of collaborations, reflect on the partnerships they have established and focus on ways to strengthen new and existing partnerships by engaging in discussion about issues and ways forward. This toolkit describes several levels of partnerships and provides a six-step process for partnership development. It also contains an extensive list of links and resources for further exploration. This resource from Alberta, provides a comprehensive framework for partnership development, as well as useful tools to assess an organization’s readiness to partner, identifying potential partners, creating partnership agreements, as well as implementing and evaluating partnership initiatives.